Breast cancer, light micrograph of a section from a metaplastic breast tumor. Metaplastic breast cancer is a rare but highly mailgnant cancer with a high incidence of spread. Metaplastic breast cancer describes a cancer that begins in one type of cell (such as those from the glands of the breast) and changes into another type of cell. 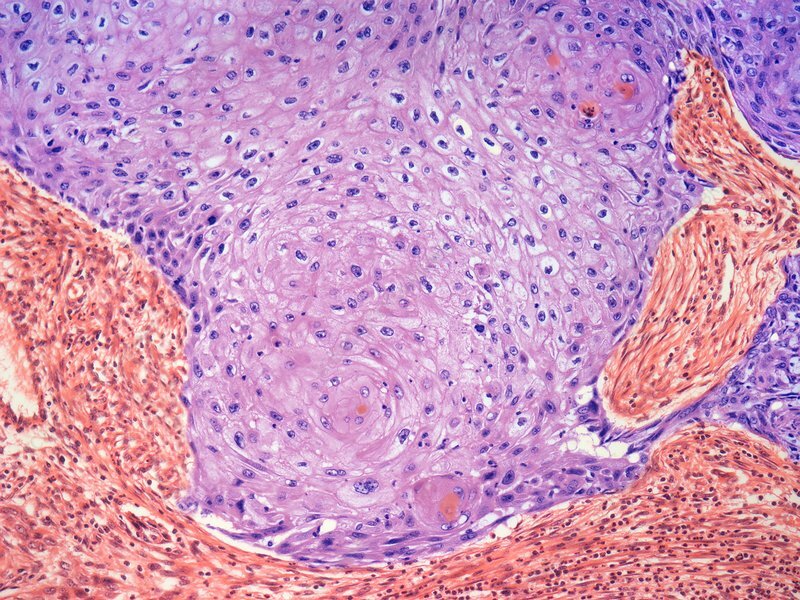 It is very different from the typical ductal or lobular breast cancer. Most cases of metaplastic breast cancer start in the epithelial cells, and then change into squamous (nonglandular) cells (purple). Magnification: x 150 when printed at 10 centimetres wide. Human tissue.